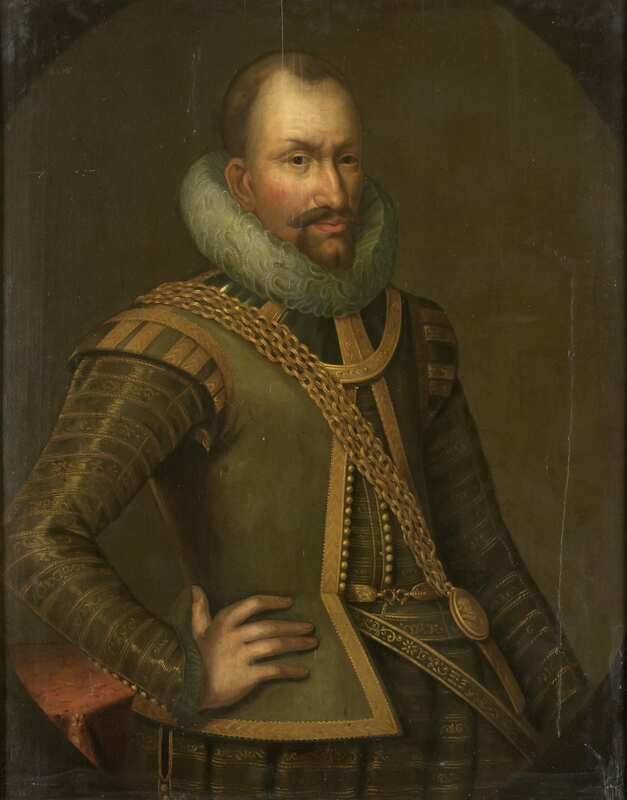 Formerly in the prestigious collection of the Earls of Balcarres, where it was mistakenly identified as General Ambrogio Spinola by Justus Sustermans, this important and impressive full-length portrait, which has survived in an excellent state of preservation, is published here for the first time correctly identified and attributed. Our research has revealed that the sitter is actually Gerard Reynst (1568 – 1615), an influential and successful merchant from Amsterdam, who served as the second Governor-General of the Dutch East Indies, and that the artist is Frans Badens (1571 – 1618), arguably one of the most respected painters active in Amsterdam at the time, but now little-known. The identification of the portrait, which was painted in 1613 in commemoration of the sitter’s appointment as Governor-General of the Dutch East Indies on 20 February of that year, is confirmed by an engraving and two poor quality bust-length copies, all three of which are today in the Rijksmuseum in Amsterdam (figs. 1 & 2). Private collection, Verona, until 2018. (Probably) E.W. Moes, Iconographia Batava, Amsterdam 1905, vol. II, p.272, no.6403. Ernst Moes mentioned a portrait of Gerard Reynst in the collection of The Hague-based Reynst family. No precise details are given of this painting, but it is very plausible that it was retained within the family before its sale in the early 20th century and its acquisition by the Earl of Crawford. 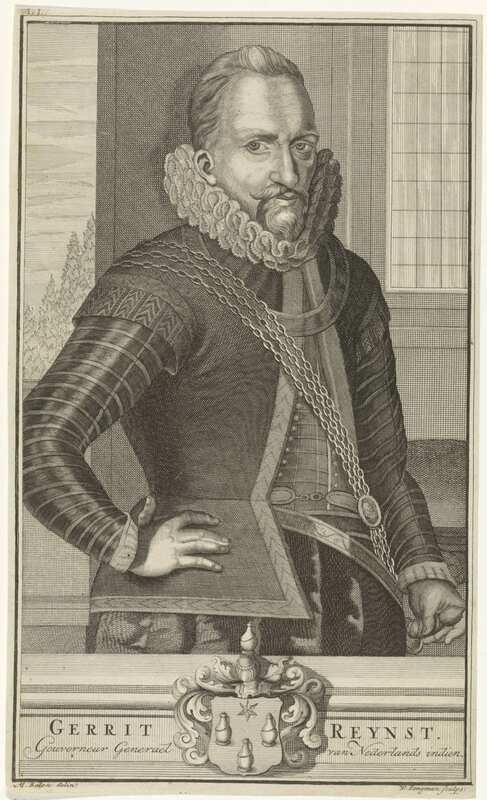 Though Reynst was from the merchant class, for this full-length Badens uses the international style of court portraiture previously created and developed in the 16th century for the portrayal of royalty and nobility by artists such as Anthonis Mor (c.1516/21 – c.1576) and Frans Pourbus the Younger (1569 – 1622). Reynst is presented in a grand tiled marble hallway, beyond which is a large doorway leading into an airy room decorated with classically inspired renaissance pilasters, which may well represent the main chambers of East India House (‘Oost-Indisch Huis’) in Amsterdam. To the right of the sitter is a table covered with an elaborate Ispahan rug from the last quarter of the 16th century, on which sits an ornate helmet (cabasset) decorated with an engraved badge, likely depicting the mythological Roman soldier Marcus Curtius. Marcus Curtius was admired in the 17th century as the very model of a hero who dies for his fatherland. Interestingly, there was a painting depicting Marcus Curtius by Frans Badens recorded in the collection of a Jean Rouyer of Amsterdam in 1702. A more ornate Italian cabasset, from c.1575, depicting the same scene is in the Metropolitan Museum of Art in New York. Should the medallion indeed represent the heroic Curtius, one could parallel his sacrificial deed to the similarly courageous Reynst when he accepted the post of Governor-General of the Dutch East Indies in 1613; the very nature of the job, that of charting unknown, foreign lands and seas on the other side of the globe, exposed to bizarre and often fatal exotic diseases as well as indigenous peoples, was potentially a death-sentence to the post-holder. 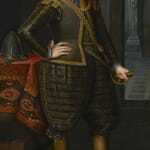 Indeed, Reynst’s term as Governor-General would be short-lived, for he died suddenly in Djakatra on 7 December 1615, after barely more than a year’s service. Another significant feature is the long gold chain worn by Reynst. 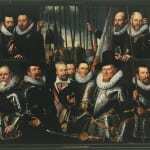 To encourage Reynst to accept the position of Governor-General of the Dutch East Indies, the Heren XVII (the seventeen delegates from the Seven Provinces who governed the VOC) – offered him the then substantial monthly salary of 700 guilders and an annual sum of 1000 guilders 'table money'. They also promised him the leadership of the Amsterdam Chamber on his return should he serve a full term of five years in the East Indies – which was not to include the time spent travelling. Upon his acceptance, the States of Holland presented him with a golden chain worth 1000 guilders and ‘a beautiful honorary medal of the same metal’. Gerard Reynst (Gerrit Reijnst) was born c.1568 to Pieter Reijnst (b.c.1510), a merchant in ashes for the soap industry. His father's shop sign was illustrated with Drie Gieters (‘Three Watering Cans’), which would subsequently be incorporated into the Reynst family coat of arms. In 1588, he married in Haarlem Margaretha Nicquet (1566 – 1603). A decade later, by now a wealthy merchant and shipper who envisaged the great potential of global trade, Reynst co-founded the (New) Brabant Company, which grew into the United Company of Amsterdam (Vereenigde Compagnie van Amsterdam). In 1602, this company was consolidated with other city trade companies, forming the Dutch East India Company (Vereenigde Nederlandische Geotroyeerde Oostindische Compagnie), arguably the largest European trade conglomerate of its type at the time. In 1603, Margaretha died during childbirth, leaving Reynst to care for his nine children. He remained close to her brother Jacques (c.1571 – 1642), for when Reynst left for the Far East in 1613, he gave him power of attorney over his estate, and guardianship of his children. Two of Reynst’s sons, Gerard and Jan, went on to become passionate art collectors like their uncle. They famously built their own museum in Amsterdam composed of paintings imported from Venice in particular, where Jan Reynst and Jacques Nicquet were based as merchants. In 1660, Gerard Reynst II's widow sold some of the best of the Italian paintings to the Dutch state, who then in turn gifted them to King Charles II to celebrate his resto- ration to the British throne. Frans Badens was Flemish by birth, born in Antwerp in 1571 where he presumably served his apprenticeship. After a sojourn in Italy from c.1593 – 1596, he seems to have spent all his working life in Amsterdam where he died in 1618 aged only forty-seven years old. Amazingly, despite his apparent celebrity and success, Badens’ oeuvre is almost completely untraceable, with only a handful of works presently attributed to him. 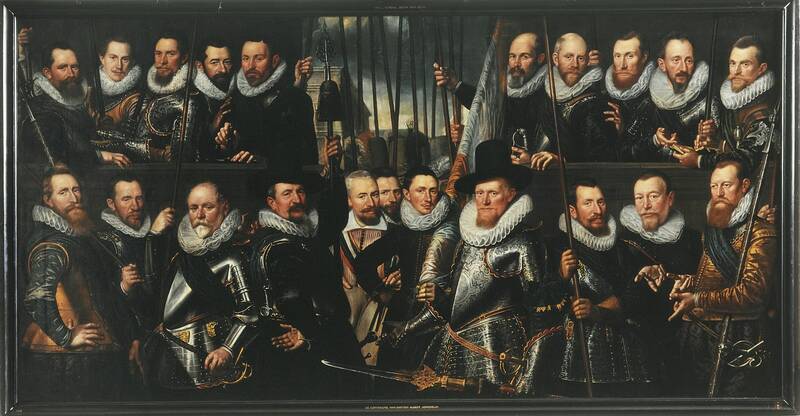 Our attribution is based on the evident stylistic match with his large group portrait depicting The Gunmen of the company of Captain Arent ten Grootenhuys and Lieutenant Jacob Floriszn Cloeck (Amsterdam Museum), from c.1608 (fig.3). The luminescent colouring, glistening flesh tones and highly mannered pose of his sitters are the most noticeable original qualities shared by our portrait with the Amsterdam group. The most directly comparable figure to ours is the bearded figure to the extreme lower left of the group, with his right arm akimbo and hand propped on his hip. The way in which Badens has splayed the sitter’s fingers, with the thumb at a near right angle to the index finger and the middle fingers placed directly in parallel to one another, is exactly the same as our portrait. Furthermore, the hard shadowing pronouncing their facial features, the observed creasing of their wrinkles, the sharp edges of their lace ruffs and carefully drawn facial hairs all possess the same handling. Compositionally, both paintings have architectural elements within their backgrounds, each showing classicised buildings at sharp, perspectival angles. Very possibly our portrait remained in the Reynst family until the early twentieth century, though there was an auction of some of the sitter’s goods, including fifteen paintings, sold to benefit his family after his death. Frustratingly none of the lots possess descriptions be- yond the word schilderijtjes (‘paintings’), so it cannot be ascertained whether our portrait was sold at this time. 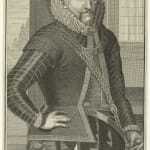 However, on 8 July 1631, Isaac Coymans, one of Reynst’s son-in-laws, transferred most of his possessions to his brother-in-law Samuel Blommaert for safe-keeping as he had been accused of embezzlement by the Church. 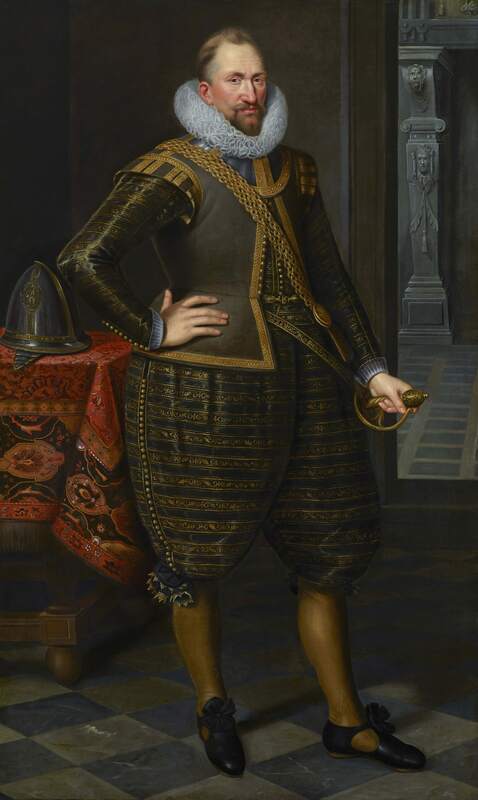 One of the paintings listed was 't conterfeytsel van Gerard Reynst in zyn leven Generael in Oost Indyen in een vergulde lyst’ (‘The portrait of Gerard Reynst in his life[time] General in the East Indies in a gilded frame’). Blommaert was also a son-in-law of Reynst, having married his daughter Catharina in 1612. 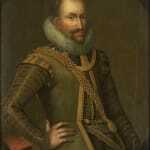 He was a founding director of the Dutch West Indies Company in 1621, a company in which a Jacobus Reynst (1621 – 1667), a cousin of our line, served as an administrator. In 1905, the Dutch art historian Ernst Moes mentioned a portrait of Gerard Reynst that was in the collection of The Hague-based Reynsts, who were direct descendants of Jacobus Reynst. W. Liedtke, Vermeer and the Delft School, New York 2001, p.458. According to legend, in 362 BC a deep chasm opened in the Roman Forum. The seers declared that the pit would never close until Rome's most valuable possession was thrown in to it. Claiming that nothing was more precious than a brave citizen, Curtius leapt, fully armed and on horse-back. A. J. van der Aa, Biographical Dictionary of the Netherlands, Vol. 21, Haarlem 1861, p.217. This is known as the 'Dutch gift'. See: D. Mahon, 'Notes on the Dutch Gift to Charles II', from The Burlington Magazine, vol.91, no.560 (Nov 1949), pp. 303 – 305. Gerrit Reynst ‘Orphan Chamber’ auction, Gerrit Jacobsz. Huis, Amsterdam, 10 March 1617. E.W. Moes, Iconographia Batava, Amsterdam 1905, vol. II, p. 272, no. 6403.